Genuine American Alligator is a fresh water crocodilian found in the wetlands of southeast United States. 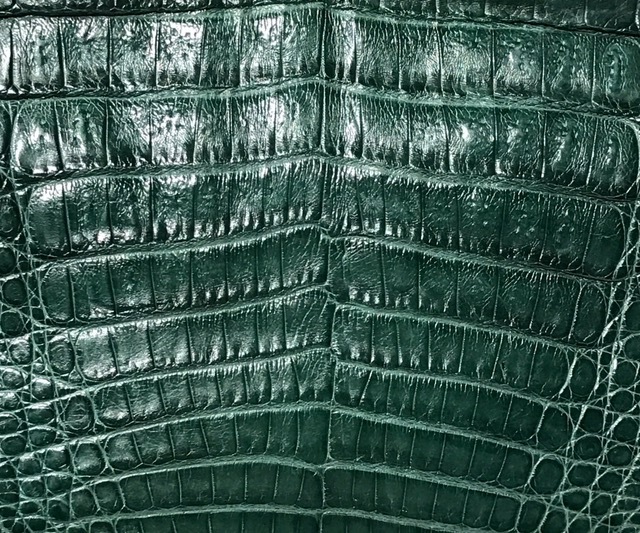 Known for its clear, mirror-like pattern, genuine American Alligator is considered to be one of the most beautiful and highest quality leathers available. Provided it is properly finished by a tannery known for quality production, genuine alligator leather should last a lifetime if cared for properly. See American Alligator 101; Comparing Exotic Leathers. Because Caiman Crocodile is used in many high priced handbags found at department and high-end speciality stores, people often ask me to explain the difference between Caiman Crocodile and American Alligator. American alligator and Caiman crocodile are easily differentiated by the pattern on the scales. American alligator (below left) is clear and mirror-like. Caiman (below right) is pockmarked with indentations throughout. Less obvious when buying a handbag, Caiman crocodile, which is found throughout Central and South America, is considered by experts to be among the lowest quality of the crocodilian. See Distinguishing Features of Crocodilian Leathers. Caiman is also considerably less expensive than American alligator. See Alligator Leather-Frequently Asked Questions. Many people believe that American alligator is an endangered species. In fact, this is far from the truth. The alligator population reached a low in the 1950’s primarily due to hunting and habitat loss. Since then, state and federal protections and habitat preservation efforts have lead to an alligator population that is thriving. See National Geographic; US Fish & Wildlife Service. At Anne Sylvain, we are committed to designing and crafting the highest quality handbags and accessories from the most beautiful sustainably sourced materials available. Using American alligator is one part of that mission. I hope you find this helpful. Don't hesitate to get in touch with any questions about alligator or Anne Sylvain.